Born in February, baby Olivia has beaten cancer. She has never been in a vegetative state nor does she suffer from a terminal or incurable disease. However, because she has been suffering from recurring infections and has been in intensive care for almost a year, health authorities at the London Great Ormond Street Hospital have indicated that they could withdraw treatment in a matter of weeks. According to Olivia’s parents, they have also been threatened with having their access to Olivia removed by social services because they complained about health care procedures in the hospital. Olivia now needs our help to survive her first Christmas. 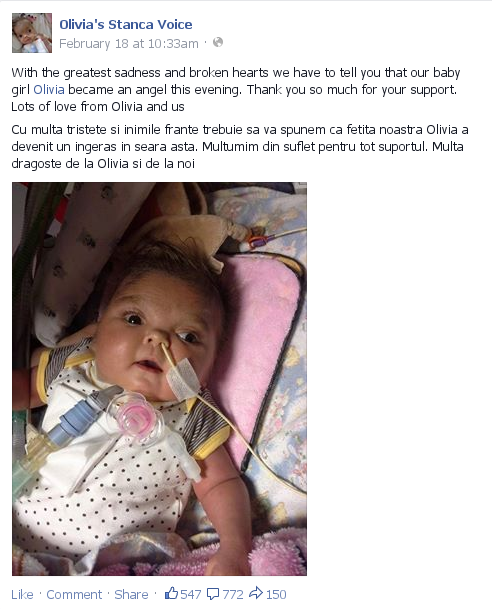 Her parents, who have been by her side every day for 10 months, are trying to raise money to get Olivia moved to a different hospital in Europe where intensive care can be continued. Please donate whatever you can afford at http://www.youcaring.com/medical-fundraiser/olivia-s-voice/268810 and share this video. 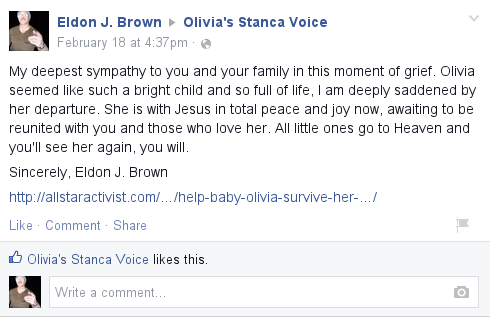 allstaractivist note: Going through prior posts only four hours after she died, I came across the appeal to support Baby Olivia. Something urged me to find out how she was now doing. I clicked on her facebook link and saw what you see below. It broke my heart even though I know she is now in Paradise with Jesus and has total joy and rest. I’m sorry for the much too short time you had here on Earth, but I’m glad too that you now get to live with God. Ugh, life is hard.